pharmaceutical product traceability is a new system to be applied to track and trace pharmaceutical products using a set of standards and systems. The Traceability Office is a new unit established at The Ethiopian Food, Medicines and Health Care Administration and Control Authority (EFDA) to implement the pharmaceutical product traceability program, a new initiative that Ethiopia will embark upon starting from 2011 Ethiopian Fiscal Year. EFDA, one of the specialized agencies under the Federal Ministry of Health, is provided with a mandate to regulate the pharmaceutical supply chain process from product (pharmaceutical) manufacturing to consumption in accordance with the Food, Medicine and Health Care Administration and Control Proclamation No. 661/2009. “Traceability” means the ability to track forward the movement through specified stage(s) of the extended supply chain and trace backward the history, application or location of a pharmaceutical product. Traceability systems keep electronic records of transactions that result in a change of ownership or location of an item and could include all trading partners in the supply chain, from manufacturer until the dispenser, and in some cases even the patient. It is an enabler for visibility of product movement in a supply chain. To facilitate the availability of safe, quality and efficacy pharmaceuticals through implementation of a pharmaceutical traceability system by using modern technology. To see availability of safe pharmaceuticals to all inhabitants of Ethiopia. This pharmaceutical traceability implementation system shall be applicable for all pharmaceutical supply chain actors. The system will be using global standard for product identification, capturee and share data to track and trace pharmaceuticals from manufacturer to health care provider throughout the supply chain. 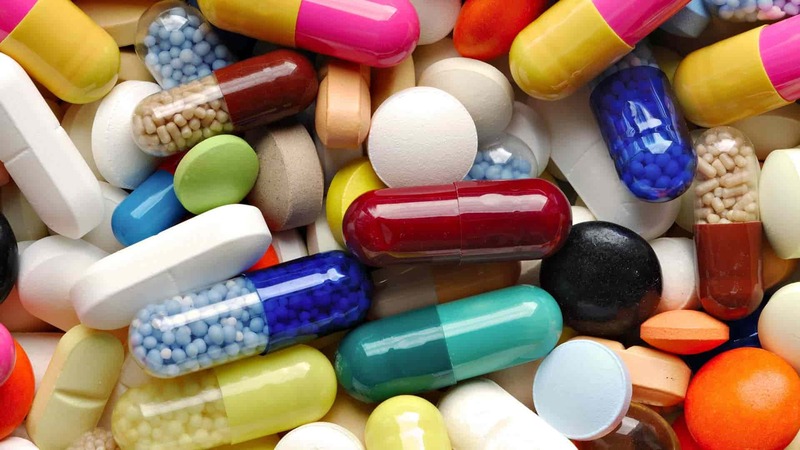 The pharmaceutical supply chain in Ethiopia is characterized by many inefficiencies caused by lack of visibility in product movement between trading partners and within organization. Also presence of falsified and counterfeit medicine negatively affects the patient safety. Many institutions and Healthcare facilities are developing their own solutions without common basic principles and globally accepted standards that enables them to track and trace product delivery from the source to the patient and back through the supply chain. This uncoordinated and fragmented approach based on diverse standards causes supply chain inefficiencies and inaccurate data that incur cost and confusion in the healthcare business, threatening quality of care and patient safety. This leads to the need for the development of global standards which provide simplicity and consistency by promoting universal applicability and optimal functionality across the globe for all industry sectors. The system will provide visibility across a value chain from raw material to the point of consumption, provide supply risk management, supply chain security, help in patient safety and prevent the use of fake and counterfeit medicine and sale of recalled medicines. The system alerts expiry date of drug, it will improve the visibility of pharmaceutical flow within the supply chain. In addition to that the system will improve effective recall process and help for decision makers in data management and analysis. The system reduces circulation of stolen and smuggled products. Tracing movement of pharmaceutical products in the supply chain using standardized product identifiers has numerous benefits for all actors in the supply chain. For patients, they would enjoy consistently safer and more effective healthcare, with fewer mistakes and shorter average hospital stays. Redundant activities and costs would be driven out of the system reducing the cost of healthcare to the public and government who use hard earned foreign currency to import medicine. For health care providers- Doctors and nurses could spend less time with paperwork and more with patients. Opportunities for innovation would open up enabling new progress in personalized medicine, customized devices, and mobile health. For manufacturers, importers, wholesalers and distributers and dispensing points, global standards could reduce the need for redundant inventories across the healthcare value chain. Reducing inventory would free capital and physical space and taking the guesswork out of inventory planning could reduce inventory inflation without raising stock-outs. Moreover, various actors including dispensing points, distributors, and manufacturers could seamlessly exchange medical device or medication usage, location and product availability information. Traceability also help reducing product waste due to obsolescence. A better view of downstream inventory levels would allow manufacturers to produce more in sync with consumption and reduce inventories. Visibility of lot numbers and expiry dates would help hospitals and pharmacies more easily manage the shelf lives of products in their inventories. Standardized product identification and a master data exchange via information-sharing networks with manufacturers would allow providers to minimize waste. Similar procedures in place in chemicals track unstable chemicals with short shelf lives, saving millions each year. identification, marking and attribution of traceable pharmaceutical products, parties and locations using Trade items – GTINs, Logistics units – SSCC and Locations – GLN. “Global Trade Item Number (GTIN)” means The GS1 identification key used to identify trade items. The key comprises a GS1 Company Prefix, an item reference and check digit “Logistic unit” means an item of any composition established for transport and/or storage of pharmaceutical products that needs to be managed through the supply chain. It is identified with an SSCC. “Global Location Number (GLN)” means the GS1 identification key used to identify physical locations or parties. The key comprises a GS1 Company Prefix, location reference, and check digit. Automatic capture (through a scan or read) of the movements or events involving an object using barcode. Barcodes are symbols that can be scanned electronically using laser or camera-based systems.They are used to encode information such as product numbers, serial numbers and batch numbers. 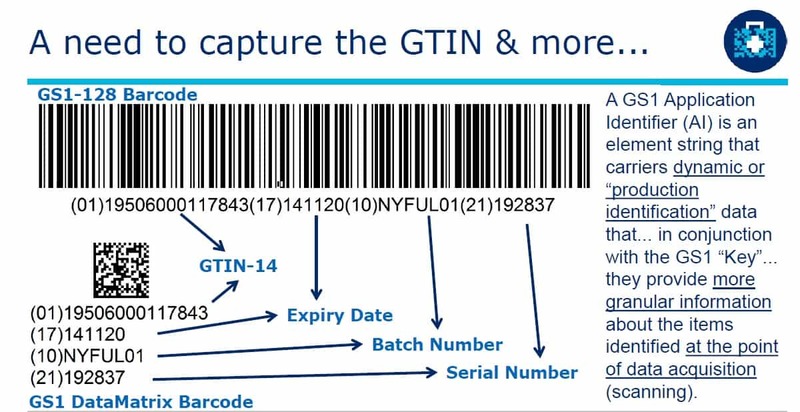 Barcodes play a key role in supply chains, enabling parties like retailers, manufacturers, transport providers and hospitals to automatically identify and track products as they move through the supply chain.The system will use GS1 standard 2D DataMatrix to capture the carried data that is unique number attained through the combination of both the global trade item number (GTIN) and serial number (SN). The Batch Number (Lot) and the Expiration Date (Exp) must also be added onto to the serialized registration data and the obtained information must be printed onto the drug unit. Recording and sharing of the traceability data, either internally or with parties in a supply chain, so that visibility to what has occurred may be realized.The track and trace system will enhance the dissemination of real time pharmaceutical information that will be used within the supply chain and controls counterfeiting. Manufacturers and suppliers directly upload data to the system after production and before the consignment leave their manufacturing facilities. The accuracy, completeness and timely upload of the data is their responsibility. 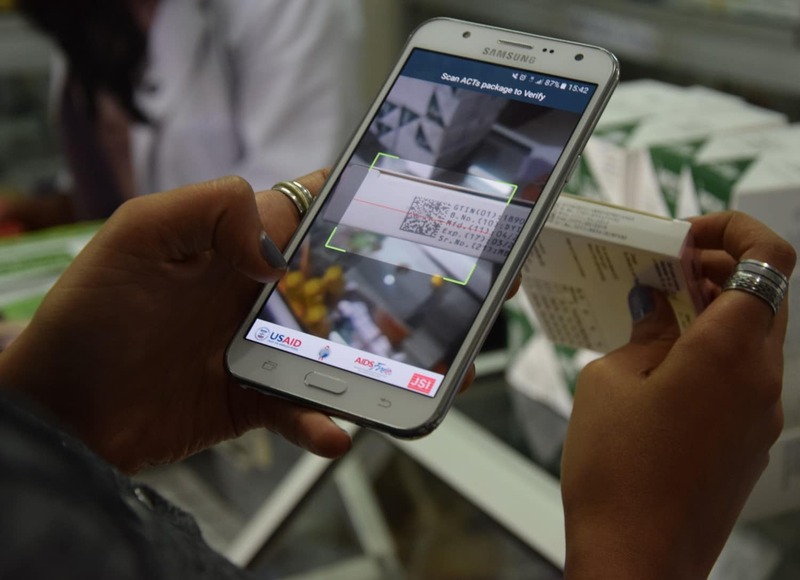 Customs officials, importers, healthcare providers and all stakeholders will and could track and trace pharmaceuticals flow by simply scanning the barcode on any of its packaging levels. When a product’s barcode is scanned, all the information associated with the product is retrieved from the system. The system will work through the notification of action types, queries and Data Matrix information that is sent from stakeholders to the system database through manual entry to the web or through API/SOAP/XML/webservice interface. All transactional events like Receiving, Picking, Loading, Shipping, buying, selling, recalls will be notified to the system in accordance with communication rules. Who are leaders in implementation? The lead implementer of the traceability activity is the Traceability Office at EFDA in collaboration with key actors in pharmaceutical supply chain including government bodies in charge of re-enforcing the pharmaceutical traceability directive. The implementation involves cooperation among all stakeholders including government institutions, medicine manufacturers, importers as well as distributors and healthcare providers who are key actors in the supply chain process. Understanding of the concept is key in endorsing and implementing the use of standards. These stakeholders come together as the Steering Committee formed by representatives from all such as Ministry of Health, Pharmaceutical Funding and Supply Agency (PFSA), Ethiopian Standards Agency, Pharmaceutical manufacturers, Importers, wholesalers, distributors and Ethiopian Medicine Manufacturer’s Association as well as Importers and Wholesalers Association among others.